Peoples Union for Democratic Rights (PUDR) has been investigating incidents of deaths in police custody and publishing reports on these from the 1980s. These investigations revealed that these deaths were most commonly the unintentional consequences of custodial torture, which in turn was part of routine police practice. In recent years, PUDR had stopped investigating and publishing reports on each incident of death in police custody since it appeared that the matter was getting greater publicity, and action seemed to be taken in each case – there was much greater media attention, magisterial inquiries were routinely undertaken, the NHRC took note of each case, and the police seemed be more aware of human rights – justice, it appeared was likely to be done. 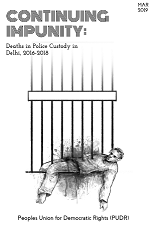 However as PUDR found and has discussed in this new report ‘Continuing Impunity: Deaths in Police Custody in Delhi, 2016-2018’ (being released today) it seems that the issue of custodial deaths is grappling with the old problems and questions. The police explanations for the majority of these cases was that these were ‘suicides’ or occurred while the victims were trying to ‘escape’. However as these investigations show there is ample ground to doubt that Sompal’s death (pages 20-23) or Deepak’s (pages 3-10) or Dalbir Singh’s deaths (pages 10-14) were the result of ‘escape attempts’ or ‘suicides.’(See discussion on pages 35-37-‘Fiction after fact’). The Metropolitan Magistrate’s inquiry has in fact stated that the police story of ‘escape’ in the case of Dalbir Singh’s death in Naraina PS is false, and has ordered that an FIR be filed against the police. There are rarely if ever any independent non police witnesses in cases of custodial deaths nor is there any independent mechanism of investigation. Thus Magisterial inquiries under S. 176 CrPC are rarely able to bring justice to the victims. In these cases discussed in the report Dalbir Singh’s case of Naraina PS is the only exception. The report shows how judicial magisterial inquiries too are rarely able to function independently (pages 37-39) Moreover the MM’s report is not a public document nor does it seem to be time bound, making it difficult for victim’s families to sustain the fight for justice. The NHRC’s failure to implement its own guidelines of monitoring these deaths, granting compensation are also evident in these cases (pages 39-41). All of these factors form the basis of the continuing impunity of the police and ensure that custodial deaths continue to occur. The Metropolitan Magistrate’s inquiry and report into all these in­cidents of custodial death under Section 176 of CrPC. should be made public. This should be done for all other cases of custodial death as well. All the police personnel implicated in these cases should be arrested and prosecuted, after an independent and fair investigation. The state should grant compensation to families of all victims of custodial death. A provision for granting of compensation by the state in all cases of custodial death should be developed urgently (based on the Calcutta High Court judgment of 6.9.17 as discussed on page 46).